The New York City Marathon is the largest marathon in the world, with 51,394 finishers in 2016 and 98,247 applicants for the 2017 race. The NYC Marathon date is 5 November, 2017. Each year, runners from across the world take on the challenge of a life: run 26.2 miles and raise funds for children who have suffered adversity or loss. 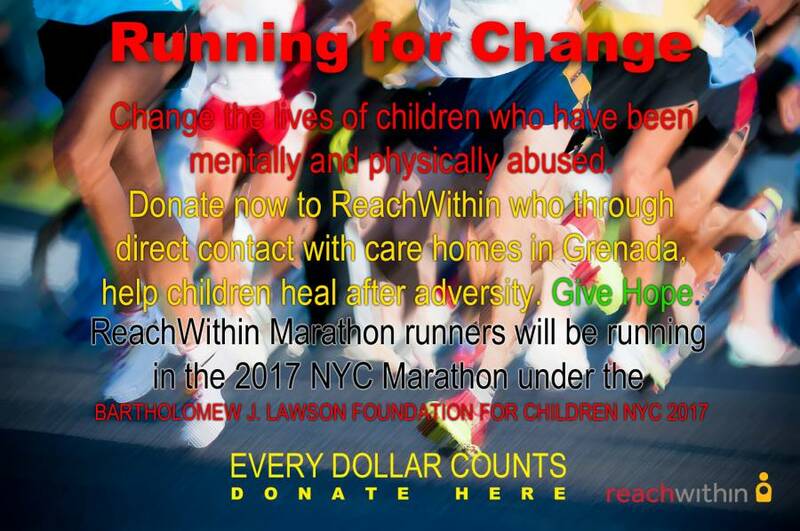 Since 2009, Team Reach has been a proud Community Charity Partner with the New York Road Runners and the NYC Marathon to run and raise funds for children who have suffered adversity or loss. 100% of all donations made to Team Reach go toward supporting reachwithin’s programmes benefitting over 200 children and caregivers in 5 residential care homes across Grenada, including Father Mallaghan’s Home for Boys in Victoria, St Mark; Bel Air Home for Children and Adolescents in Calliste, St George; Queen Elizabeth Home in Tempe, St George; Dorothy Hopkins Centre for the Disabled in Tempe, St George; and the Women’s Emergency Shelter. The Bartholomew J Lawson Foundation for Children (BJLFC) is a nonprofit 501(c)(3) organisation dedicated to improving the futures of children who have experienced adversity or loss by helping to them develop social-emotional literacy, self-confidence and resiliency in the presence of caring adults. Reachwithin (RW), the principal programme of BJLFC, is a 2-pronged model of care that includes youth life skills building and caregiver training in a variety of settings. RW’s Youth Life Skills programme teaches children and helps children lead more empowered lives through group classes that include age-appropriate yoga, summer art workshops and therapeutic drumming. RW’s Caregiver Education Programme empowers caregivers with tools needed to create happier, healthier and safer environments for children and themselves. For more information, please visit: www.reachwithin.org.